Just two hours from Paris and Disneyland Paris, and close to the stunning Champagne region, La Croix du Vieux Pont is a luxury camping site with something for everyone. If you're looking for the perfect camping holiday, this lovely campsite set in the scenic village of Berny Rivière offers a wide range of leisure activities, on site facilities, dining opportunities and more. Book a holiday here and remember it for a lifetime! 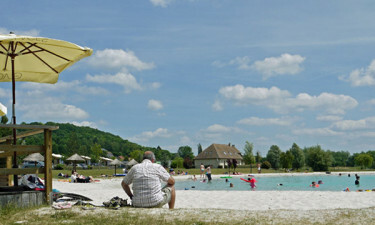 Why camp at La Croix du Vieux Pont? La Croix du Vieux Pont offers several fantastic accommodation options. Stay in a mobile home and enjoy pure camping luxury. With spacious layouts and refined decor, these mobile homes all have plenty of storage space, fully sprung beds, fantastic shower and bathroom facilities, and plenty of space to relax. La Croix du Vieux Pont has everything you need to keep you busy during your stay. More active campers will enjoy laser tag, climbing walls, archery and bowling. Sports fans will love the football, tennis and beach volleyball courts, and kids of all ages will have a great time in the campsite's own heated pool complex. Enjoy the thrills of slides and waterfalls, relax with a hydro massage, or simply sunbathe on a sandy lakeside beach. La Croix du Vieux Pont is set in a 100 acre park surrounded by beautiful countryside, perfect for picnicking, exploring and playing outside with the kids. You can explore the area on horseback, hire a bike and check out the area's many cycle paths, or take a long ramble on foot. If you love to fish, you'll find ample opportunities in both the River Aisne and nearby lakes. 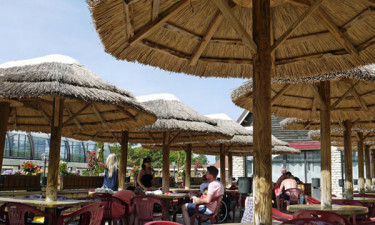 Check out La Croix du Vieux Pont's rustic restaurant and bar with its welcoming fireplace and traditional menu, or enjoy the exotic Macao beach bar's delicious offerings. You can also find wonderful takeaway food at Berny's Burger, which offers pizza, kebabs, salads and more to eat on the terrace or take away. The campsite's onsite shop and bakery will meet all your grocery needs, offering a wide range of local produce and fresh bread and pastries. You can also find local groceries in the nearby village of Berny Rivière. If you want to travel further afield, you'll find many shopping destinations in the Picardy region. The nearby towns of Beauvais, Chantilly and Compiègne all offer local markets and a range of delightful shops.